For more information, visit Twelve Tiles. One-Sentence Story: Unravel the secrets of an underground fencing organization that requires members to wager their most precious possessions. But what happens when members leave? And why are Prized Possessions such an integral part of FOIL's structure? As her experience in the isolated Chȃteau de l'Hiver proves menacing, Florentine investigates what evolves into a mysterious and ugly truth. Fleuret Blanc was created from 2011 to 2012 and released for free in July of 2012. It was my first "solo" game, but many people helped contribute, including Michael "Garoad" Kelly, Sabrina Valenzuela, Kan Gao, Sarai White, and plenty of other generous and talented people. If I were to make the game today there would be a lot more polish and much better design here and there, but as a whole, I truly love this game and the story it tells. I hope you enjoy it! Fleuret Blanc is primarily about the importance of objects in our life. Though the storyline follows Florentine as she unravels the mysteries of FOIL and its judges, she's constantly challenged with ideas of possession, collection, and obsession. The game rewards Florentine--who starts as a minimalist traveler--with points based not only on how much she interacts with her fellow members, but also on how much money she makes and how many items she's hoarded in her room. Though collecting is encouraged for a better score, the overall implications of the act can be bittersweet. Time flows across seven days. Each day is broken up into morning, afternoon, and evening. Within those three sections, the player may explore, bout, gossip, and go through their notes however they like. However, Events take up Free Time. There are only three "segments" of Free Time within each section of the day, so use them wisely. 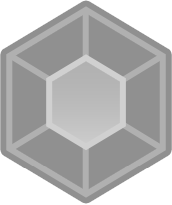 Once three events have been seen, all other events will disappear until the player forces time to progress. Fencing against other members is mandatory in the evenings (Trophy Bouts), but optional during the rest of the day. Unlike typical "battles," the winner is based on how stylishly they performed, even if their health went down first. Winners either take control of their opponent's Prized Possession, or regain their own. Florentine gets paid based on her performance as well: the style points she accrues during bouts correlate directly to her income. This means that the player makes money not by winning, but by doing their job as a fencer. There is no experience or leveling, and each member follows the same exact rules of combat as the player. A move's success is based both on predicting the opponent's attacks (based on current bout conditions) and successfully completing timing or button-pressing indicators that appear on the screen. Each opponent has their own set of special techniques that separates them from the others. With enough money, the player may persuade someone to teach them these techniques. Florentine's "home base" is her bedroom where she stores the trophies of other members. She also may find or purchase other nic-nacs to hoard, transforming her simple sleeping quarters into a carnival of colors. Changing techniques and saving in the journal are just a few of the things that can be done here. Witnessing events (mandatory or not) may bring up "interesting" ideas that Florentine will take note of in her electronic journal. These Points of Interest all pile toward conclusions that she has yet to make. Filling in the prerequisite for conclusions can lead to bonus events that open up the story and have an effect on the ending. Collecting the best information may require gossiping. A select few members are as moral-less as Florentine and will engage in gossip about the last person, place, or thing that the player has come in contact with. (For example, if you click on a plant and then gossip with Roland, he'll give you his two cents about the local shrubbery). Like any good main menu, you have to have the option to quit before you've started. Winning a bout always leads to talking with dogs. This is the way of the world. The King may not be great at telling your fortune, but he excels at taking your money. Hey, nice to see this one here! I played it an eternity ago and have forgotten pretty much everything. Should give it another try one of these days. I didn't remember it was so long though! According to the data the testers have given me, it can get pretty long. I think 12 hours was max, though. And it's not a game where you grind, so there's a nice density to it. I have a question about the scavenger hunt though, about the clue when Roland tells you it reminds him of 'laundry', I've tried going to the laundry room but apparently it's locked? Is the note supposed to be in there or some other place? Also after I've reached the 'conclusion' about Nickel's gambling thingy and the true purpose of FOIL, when I've tried to approach both Grams and Nickle, there seems to be an error that pops up and close the game? Do I need to collect something to trigger the scene so it won't crash? And whenever I try to press F12 to go back to the title, an error pops up after I try to load. What's the error called? Could you get a screenshot of it? I've never actually encountered this one before, but it could be a dropped file of some sort. Maybe a sound effect or something. Hopefully it's a quick fix! As for the F12 function, I've never quite worked that one out. I personally never use F12, so when it was brought to my attention the first time I had no idea what to think. Wow, I have no idea why that file would be missing! I just installed the exact download that's available here and it comes with that song. 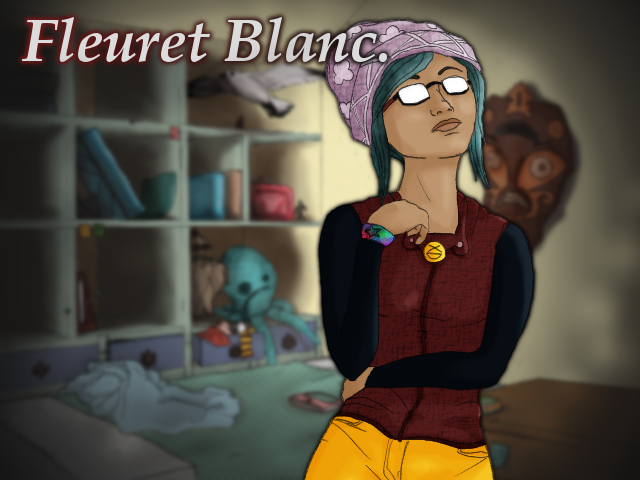 Download this file and stick it in the Audio/BGM folder of the Fleuret Blanc folder within your program files. Hopefully that should fix it. EDIT: If this file doesn't work, name this file the exact name called for in that error and it should! I hope! DOUBLE EDIT: Dropbox link updated. That one should work. If you check that Audio/BGM folder, you should have 34 songs total. I guess you only have 33 if this one is missing, although I still don't understand where it went. XD Sorry for all of this trouble! Okay I've finally checked the BGM file and I'm such a dork... the french 'special' letters for some reason turns into Chinese (I have Chinese typing as well in my computer), and it seems the other letters are in Chinese as well so it may pose a problem in the future. Oh well, I'll just find a way to change the words back. Thanks for your patience! Oh, yeah, that one's unnecessarily hard. XD Check the drain in the kitchen. Some kitchens have large floor drains, and this is one of them! Here's a link to my Bandcamp page. You can see all of the tracks and just copy the symbols back into the tracks you need. That should fix it right up! I think I'm on a dilemma. I'm already at the point where I can't speak to Kant and I haven't figured out his bottom-left "???". :| Is that info only out after I solved some mystery regarding what he said with the judges?? There's also 2 music names that I can't find from your link... they're "Respirez Profond_ent" and "R_oudre". Oooh now I'm excited haha! Did I mention the cast is oh-so lovely? Roland is so dorky and his scene with Aunty who offered him some 'bedtime stories' - I couldn't stop laughing at that scene! xD And his interactions with Flore are priceless! Well you can help getting it in the limelight by writing a review! I've started it a couple of days ago but real life has finally caught up. I've lots of things to say about it though, so I may write one of my own sooner or later! (I realized that I had actually played it an eternity ago, for probably roughly 15 minutes before forgetting to continue for some reason or other). This all extremely nice to hear. :) Thank you very much! I like the chemistry Flore and Roland have as well. I haven't written a review before, and I'm sure other... more eloquent members will definitely write one in the future! I'm definitely gonna replay the game - that's for sure. Though I'm a bit worried if I'm gonna miss collecting the infos of the other characters - especially the last "???" of Masque and a bunch of "???" for Odon. The events of the entire last day are altered by which Conclusions you find. The same goes for the sticky note bios during the end credits. For example, during the final day, Odon goes out and meditates rather than helps. But if you solve the Conclusion associated with him, he'll stick around and help you. So if you want to unlock all of the extra Kant material, you need to solve the corresponding Conclusion and do its corresponding Confrontation event. Or, maybe one day someone will get the full ending and post it on YouTube!